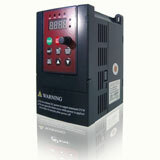 What are the general rules for safeguarding machinery incorporating motors driven by frequency inverters? For example, should the contactors be on the input or the output? 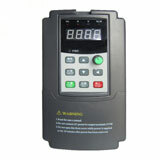 A contactor on the input of the frequency inverter rather than the output is preferred, although on can make the case for one on the output. Placing the contactor on the input of the inverter would shut off all power to the motor, but there could be a small delay due to the energy stored in the capacitors in the frequency inverter power supply. This would be safe, would not damage the inverter and would prevent direct-online switching on the output of the frequency inverter. The inverter would always start from zero when the contactor was re-closed. You may have to reset an under-voltage trip on the inverter, but that may be automated if required. You may also use soft starts between the frequency inverter and the motor.